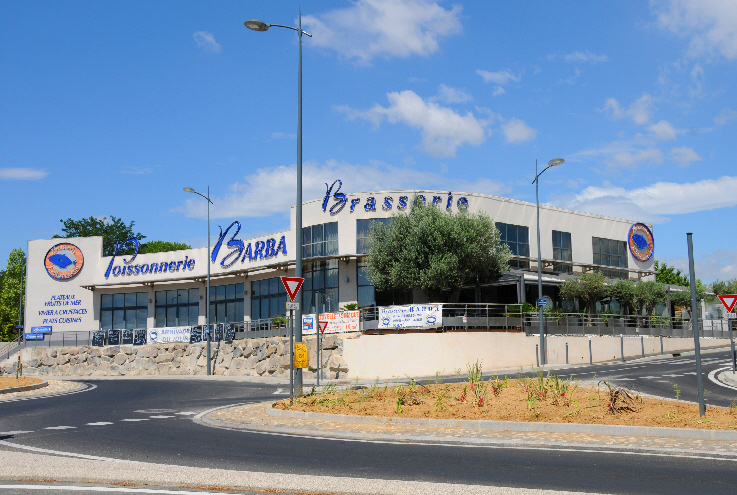 I've been wanting to stop into the poissonnerie (fish market) that is attached to La Brasserie Barba for quite some time but I always seem to miss the turnoff. On this trip, I discovered that the problem was that the exit on the roundabout is not marked as I expected. Problem solved if you come at it from the opposite direction. So this time we found it and, although we missed the market because it didn't open until some time after we'd finished our lunch, now that we know how to get there, and now that we know that the restaurant is worth a repeat visit, we'll be back. 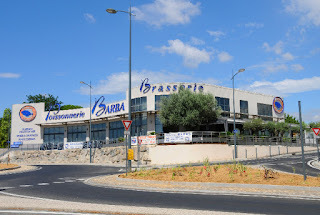 The exterior of the building has an industrial modern flavor but the brasserie is of the white tablecloth and sparkling crystal variety. Our waitress was attentive without being intrusive and had enough English to answer the question or two that we couldn't answer for ourselves from the extensive menu. Our meal began with a small tray with three amuse-bouches - olives, tiny crisp-roasted shrimp, and a snail-like little shelled creature that required some digging to get out. All very proper. The girls picked from the menu of the day. Connie started with mussels en croustade, juicy mussels with a tomato-based (but not Italian) veggie medley in a ring of pastry. Cathey chose the smoked mackerel pressed in a vegetable terrine. Both were inventive, tasty starters. Connie then had the bonita, Cathey the sole meuniere. Both properly done. Both with a nicely prepared, cheesy cauliflower side. I'm not a big seafood guy. Steak/frites for me. The beef was above the average for the region and I enjoyed it. I was the only one with room for dessert, chocolate ice cream. The waitress asked, almost with a wink, if I'd like a bit of chantilly. Of course. The French really do know how to do chocolate, ice cream, and chantilly. With a bottle of regional rose from Domaine La Croix Belle, a favorite winery, and coffee at the finish, the total tab was 94.10 euros. That's a bit more than we usually pay but this was an exceptional meal in genteel surroundings, worth the price. Our new, special local seafood place.